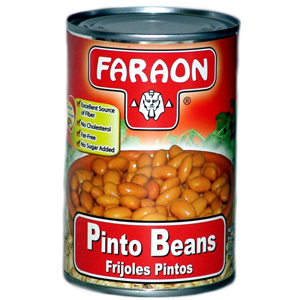 Faraon Pinto Beans are ready to eat, fully cooked to perfection. They are excellent for use in side dishes or full meals by adding your favorite meat or cheese. Our 15 ounce can serves three persons. Our pinto beans are 100% fat free, no trans fats, no cholesterol and are a great source of fiber. If you want to raise the flavor a notch in just 10 minutes, add a dry chili pod and boil for 2 minutes, then lower the heat to medium for 8 minutes.